A kind of new molecularly imprinted polymer (MIP) was synthesized by bulk polymerization using guanosine as dummy template molecule, α-methacrylic acid as functional monomer and ethylene glycol dimethyl acrylic ester as crosslinker. Fourier transform infrared spectroscopy (FT-IR) and scanning electron microscopy (SEM) showed that the MIP had homogenous and uniform-sized cavities. It was confirmed that the MIP had higher binding affinity and selectivity towards gonyautoxins 1,4 (GTX 1,4) than the non-imprinted polymer (NIP) according to the static equilibrium adsorption. 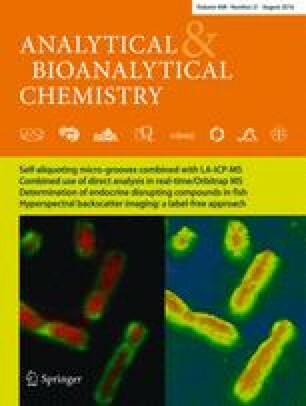 An off-line molecularly imprinted solid-phase extraction (MISPE) method followed by high-performance liquid chromatography with fluorescence detection (HPLC-FLD) was established for the analysis of GTX 1,4. 0.1 mol/L acetic acid and 95:5 (v:v) methanol/water were optimized as the washing and elution solutions, respectively. The recoveries of spiked cultured seawater samples were satisfactory, as high as 88 %. Using this method, the concentrations of GTX 1,4 from cultured seawater samples of Alexandrium minutum and Alexandrium tamarense were detected to be 1.10 μg/L and 0.99 μg/L, respectively. This work was supported by National Programme on Global Change and Air-Sea Interaction under Grant number GASI-03-01-02-01 and the Public Science and Technology Research Funds Projects of Ocean under Grant number 201505034.